Moodle 3.5 looks better than ever with Bootstrap 4. Moodle has never looked better! In addition to new features and improvements, Moodle 3.5 users can enjoy a user-friendly display and images in the course overview. These improvements are made available through Bootstrap 4, the newest version of Bootstrap which is included in Moodle 3.5 as standard. Moodle 3.5 can be downloaded for free from moodle.org. The inclusion of Bootstrap 4 is a result of our goal of improving user experience based on design work from our UX team and feedback from our community. How can it improve Moodle? How is Bootstrap used in Moodle 3.5? Using Moodle 3.5, when viewing their dashboard, a teacher can see which enrolled courses have been enhanced with images. If no image has been uploaded a coloured pattern will appear instead. The Moodle 3.5 navigation draw has new icons, which continue into the course. Plus, to improve usability, links are highlighted when clicked on. 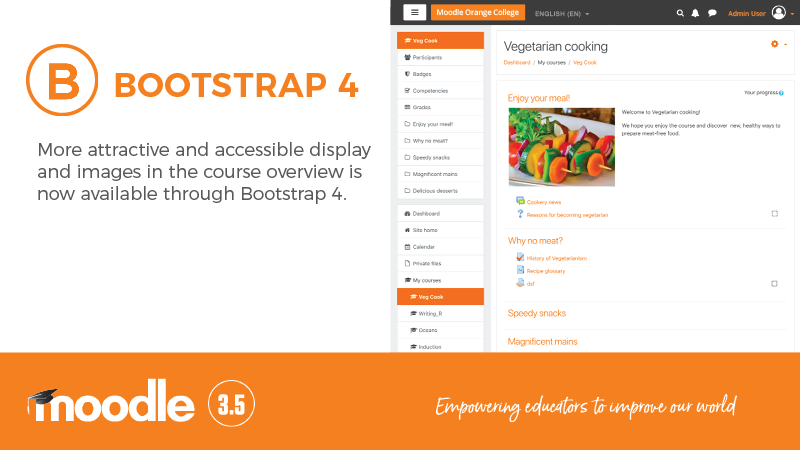 To experience the benefits of Bootstrap 4 for yourself, download Moodle 3.5 for free from moodle.org.